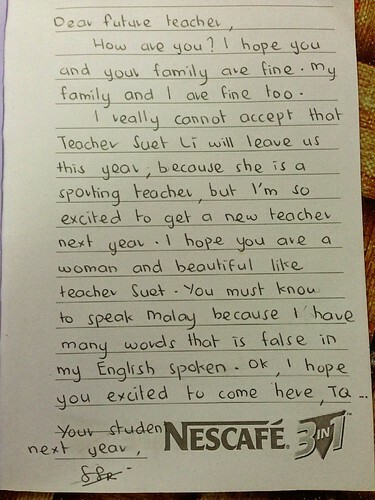 528 Comments on Happy Teacher’s Day! Thing are going fine in school, not absolutely great but I’m doing slightly better than just surviving. 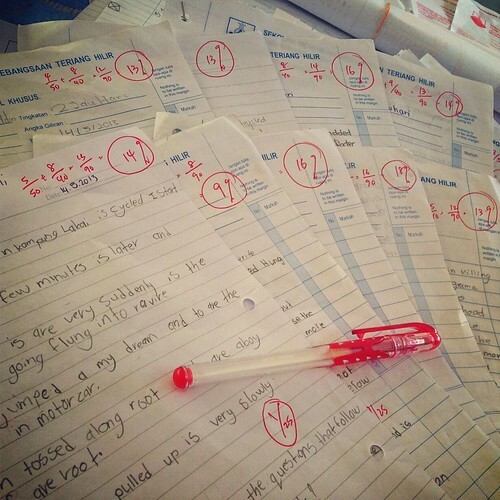 I was marking my students papers and very very sadly, most of my classes did pretty poorly. Obviously, it’s not any of my students’ fault and I’m glad we still have a few months to work on our weaknesses before I leave. 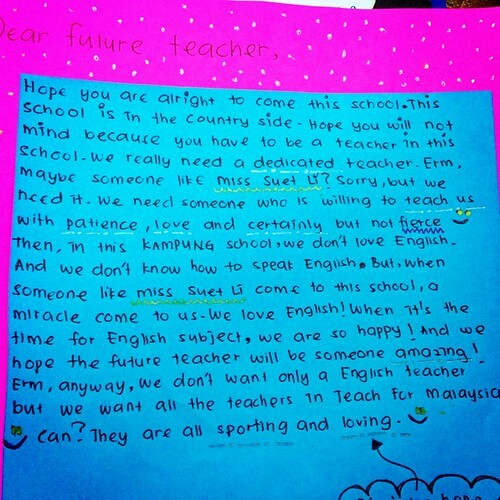 Yeap, this is my last year teaching. The program is ending this year and unfortunately, I will not be continuing my career here in this school. I like it here, I like the students, the school, the community, but I just can’t continue travelling so far and being away from home anymore. I know it’s a weak and lame excuse, and I feel terrible for leaving. 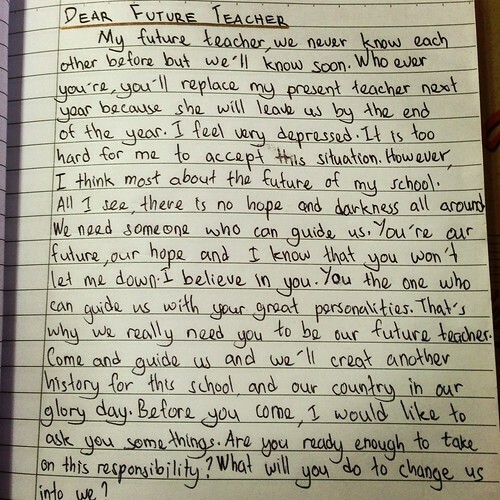 I told my students to write a letter to their future teacher, the teacher who will be replacing me (hopefully there’ll be one..). I told them to write anything they want and be sure to write a good one so I can use these letters to encourage people to come and teach them. The results were something I didn’t quite expect. Their letters were AMAZING, so filled with emotions and were very inspiring! I really hope that these kids will get an even better teacher next year because they totally deserve the best education despite being so far away from civilization. Any beautiful woman wants to be this teacher’s pet’s teacher? Haha! He’s actually one of the cheekiest boys in class, always interjecting my lessons with irrelevant (but funny) comments. Can you expand her horizons for her? I can’t believe the depth of these letters. All they really really need and want is someone who can show them what’s out there, what lies ahead beyond their small village. HE knows you can do it, come and guide them so you guys can create history together! These kids are 15 by the way. They need someone patient and caring, someone who can show them English is important and can be exciting too. Seriously, rereading these letters make me feel so bad for leaving and so terribly guilty because these kids are incredible. Of course, this job is challenging as hell but accepting the challenge has made me such a changed person. Most of my students are at least FIVE years behind their grade level. These letters here are from my best class, and my four other classes can barely string a sentence together. This is the results from my weakest class. 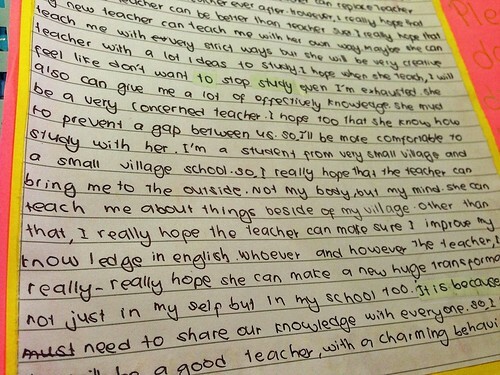 I was devastated when I finished marking, and was really depressed for the entire day. But then I realized something. They ALL tried their best! Nobody left their papers empty, nobody scribbled nonsense or gave up upon seeing all these words they don’t recognize. Success doesn’t come easily and seriously, when you’re in this profession, you’ll realize that what doesn’t kill you REALLY does make you stronger. Happy Teacher’s Day to myself and to all you amazing teachers out there. I bow my head in respect for all the hard work you’ve put into making your students better people everyday without fail. I have the highest respect and admiration for teachers who remain positive and passionate even after being in this profession for many many years.